As a blogger it’s fun to connect with like-minded people who I would never have met in person. On the other hand I don’t use my personal accounts much at all. My Facebook feed is constantly bombarded by “selfies,” “duck faces,” and the same annoying e-cards over and over. While this is enough to drive anyone up the wall (unless you’re one of the people who post these things) there’s another downside to social media: the role it plays on your finances. Plus, we’ve discussed in the past how Facebook costs you money. 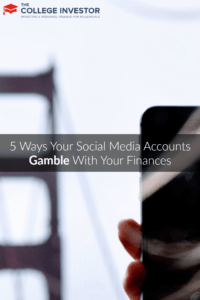 Browsing your Facebook feed, posting a couple of tweets, or connecting on LinkedIn may seem innocent enough, but the truth is it could wreak havoc on your finances. Here’s how. According to a recent article published by CNN Money, your Facebook friends could impact your chances of getting approved for a loan. A handful of lenders will now search your Facebook friends when you apply for a loan through them. If you have a friend who has made a late payment or defaulted on one of their loans your chances of getting approved will be drastically lowered. If you’re on the market for a new loan your best bet might be deleting your Facebook account altogether. Lending Club has been assessing social media accounts in addition to normal credit checks to help determine credit worthiness for three years. There are now companies that assess your credit worthiness by your social media behavior. These companies will watch your activity on sites like Facebook and Twitter to help determine your credit worthiness. The information you post, frequency in which you post, and your friends list is all taken into consideration. This could become the norm for banks and lending institutions in years to come. This is one more reason why you should seriously think about what you post. If you’re in the market for a new job, delete any embarrassing comments or pictures of yourself from your social media accounts. More and more employers are searching for your name in Google and checking your social media accounts to get an idea of what type of person you are. Negative comments, drunken pictures, or constant complaining could seriously decrease your chances of getting hired. Don’t think this is just for new hires either. Your boss could check out your social media accounts at any time. If you want to find a new job or hold on to the one you have you need to watch what you post. There have been online phishing scams since the day the internet was born. Unfortunately the scammers have only gotten smarter. A possible identity thief has a far greater chance of hacking into your accounts if you share a lot of information on social media. If the identify thief can verify your birthday, parents’ names, and city you grew up in, he’ll be one step closer to getting access to your online accounts. This is why you should only add people you know to your social media accounts. You can also help avoid identity theft by setting your account to private and limiting the amount of information you share. You will never know your identity has been stolen unless you check your credit regularly or go to apply for a loan and get denied. Consider using a free service like Credit Karma to check your credit score and see if you’ve been impacted by identity theft. Remember, don’t pay — Credit Karma is free as long as you cancel within seven days! Social media can be great for connecting with old friends. But what happens when those friends are constantly publishing pictures of themselves in their big houses, fancy cars, and brand new toys or clothes? You probably feel a little envious — at least for a little while. Social media definitely pressures you to “keep up with the Joneses.” If you’re in debt, on a tight budget, or trying to save money, social networks like Facebook can increase the temptation to spend. Just remember everything is not always what it seems. Those friends posting pictures of all their expensive possessions might just be deep in debt. Worse yet, those material possessions could be covering up an unhappy life. Social media can play a bigger role in your finances than you think. You can minimize your risk by only friending people you know and by limiting the amount of personal information you share. It’s easy for people to see the information you post online. Remember only to share information that you’re not going to regret posting in a month from now. What other things should social media users remember when it comes to your finances? The whole “facebook envy” thing is really interesting. It’s very easy to see the cool pictures that your friends are posting and think that their whole life is just one big dream. But I look at my own profile and it’s also only happy pictures. There isn’t anything showing the dull moments or the arguments I have with family or co-workers. Anyways, I could definitely see people spending more because of jealousy they feel from looking at other people’s social media. It would be interesting to see some real research on that. I think Facebook envy is normal. Most people do only post the positive things about their life so it’s easy to feel envious when you aren’t seeing the big picture. I know some US states are starting to pass laws intended to protect individuals from employment problems related to their social media, but it’s not nationwide yet. I agree that being denied a long because of who you are friends with on Facebook is a little, well, creepy. I was surprised that several companies are already doing this and several more are considering it. Who knows? It may become the norm in the future. I’d feel pretty bad deleting friends just because I knew they had bad credit though. I have not experienced any of these pitfalls. To me, it is blaming social media or credit cards for for irresponsibility. Good tips on protecting yourself on social media. Facebook is such a pain to get the privacy settings the way I want. Short of having a separate account, I still haven’t figured out how to really tell how my account appears to people outside my network. Their “view how other see me” is not exactly right. The increased spending due to envy is the least of my worries. Most all my friends live in little shacks comparable to mine. I work in a field that has seen many, many jobs lost because of poor social media privacy settings and bad behaviour on Facebook. You are right, as well – there are a lot of studies that show that social media can make us jealous and feel inadequate, which no doubt makes you spend more.